Slotsquad Play Copy Cats Slot with £30 - Did We Win? Just recently we reviewed the Copy Cats Slot from NetEnt. The developer’s new 25p slots game that’s full of both whiskers and winnings. At 96.76% payout rate, it joins other games from NetEnt that deliver high-ratio returns. But wait, how big are these returns? So the question is, how much can you win playing Copy Cats? Before we go any further, matching new slots with the best UK slot sites to play them is our business. At Slotsquad, we make those matches. This time around, we choose to play Copy Cats at Casino Room. Why? well, it’s a good casino, it’s also got one of the largest deposit bonuses available up to £500. But wagering is high at 45 x that bonus. So the best deposit to make, as I did. £30. If you deposit £30 at Casinoroom.com, you can play the slots and games with £60. The deposit 30 get 60 model is pretty standard, but few slot websites can match the 800 plus game vault at Casino Room. Full of shabby cats, grinning animation and good humour. 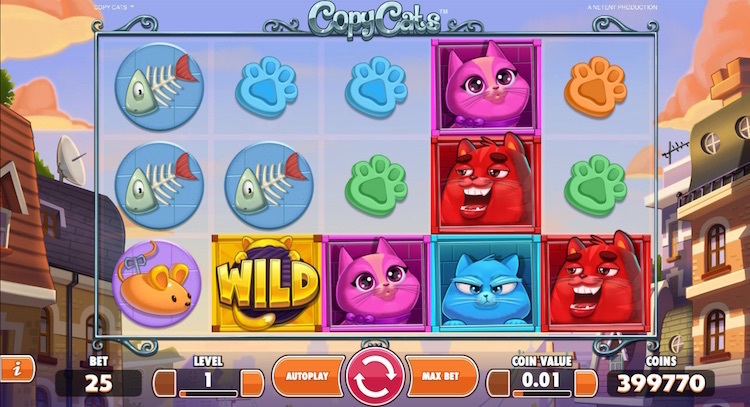 Copy Cats is the latest cat slot on the block. You play 25 lines against various betting limits with spins from 25p to £125.00. So what are we getting for that money? 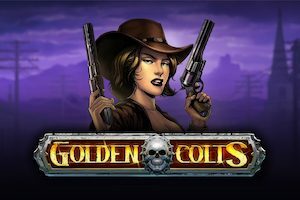 NetEnt thinks that free spins and stacked wilds are enough to keep slots players happy. And it is, providing there’s special treatment with those stacks. In this case, it’s the science of Copy Cats. The Copy Cats bonus is good but in terms of winning. By example, I believe you want the 10 free spins bonus instead. 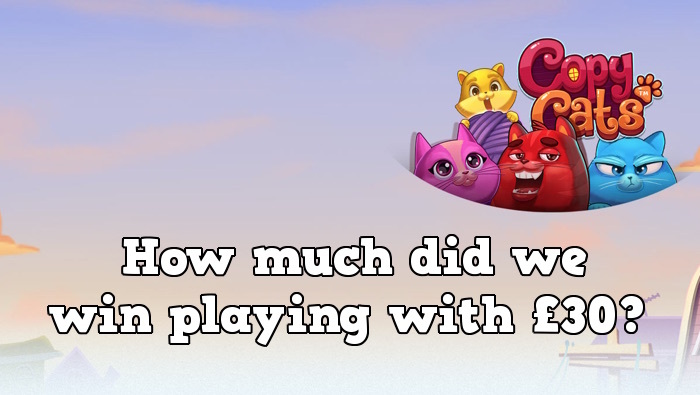 That’s because the Copy Cats bonus can still be activated during the free spins. So with the free spins, your really getting free Copy Cat chances. It’s in this scenario that the biggest wins can happen, even mega wins. We played the Copy Cats online slot with £30 to see how much that £30 returned if anything. The hard truth about gambling is that we want more from less. Not even cats can guarantee us that. Casino Room is naturally our choice for this week’s new slot – casino match. So what happened with our £30, and what could happen if you deposit 30 to play with 60. Setting up the slot, I’m choosing bet level 6 which is 150 x £0.02 meaning £3.00 a spin. It’s very confusing I know but just look at the bet value (center screen) below the spin button. When messing around with your bet levels, you can see the spin cost change here. Ok then, £30 at £3.00 a spin is 10 spins, so what happened next? How much can you win playing Copy Cats with £30? Playing through the 10 spins, spin 1 returned zero. Spin 2 was better winning £3.60. Spin 3 was zero. Spin 4 was the best spin winning £5.40. Spins 5, 6 and 7 returned zero. Spin 8 won £1.80, spin 9 zero and finally spin 10 netted £1.20. That’s a grand total of £13.80 playing Copy Cats at £3.00 a spin with a £30 budget. Unfortunately a loss of £16.20. In this case study, I’m not going to continue with the £13.80, because we want to see how the slots return is over £30. It’s obvious that missing both the free spins and Copy Cats bonuses had an impact. It’s also worth noting that each of the winning spins was a minor win. Just a bad day at the office, but you might do better than me.